Picturesque and Sublime: Thomas Cole’s Trans-Atlantic Inheritance opened last month at the Thomas Cole National Historic Site in Catskill, New York. The show is a collaboration between a group of scholars at Yale — doctoral candidates Sophie Lynford and Nicholas Robbins, Gillian Forrester, Senior Curator of European Art at the Whitworth Art Gallery, University of Manchester (and formerly curator at the Yale Center for British Art) and professors Jennifer Raab and Tim Barringer. 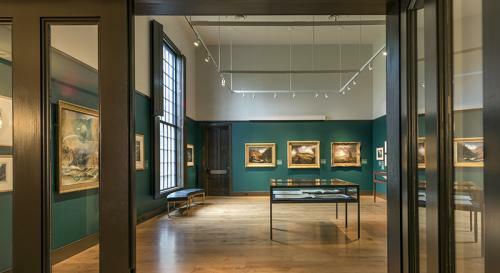 The exhibition, which fills the artist’s reconstructed studio in Catskill, repositions Cole as a transatlantic figure, born in Britain, who arrived in the United States just two hundred years ago in 1818. It explores the role of prints as agents in defining and disseminating the aesthetic categories—the picturesque and the sublime—that shaped Cole’s artistic development. The themes and objects selected for the exhibition developed out of conversations begun during the graduate seminar “Landscape, Mobility, and Dislocation” (co-taught by Raab and Barringer in the fall of 2016), and which continued in the study room at the Yale Center for British Art. Drawn primarily from the rich holdings of the YCBA, the exhibition features a selection of Cole’s major works from public and private collections. A fully illustrated catalogue, published by Yale University Press, accompanies the exhibition, featuring essays by the curators on Cole’s engagement with Anglo-American landscape aesthetics; the relationship between Cole and William Guy Wall, the British-born artist best known for the Hudson River Portfolio; and the formative role that paper played in Cole’s artistic development. https://yalebooks.yale.edu/book/9780300233537/picturesque-and-sublime. The exhibition runs until November 4, 2018.